Don't just be an out of the box thinker; be a cube thinker as well with these clever 70 x 70 x 70 mm sticky note cubes. These tall towers of paper have plenty of writing space to jot down those creative ideas and the cubes' outer glued-binding keeps all the papers together. Each piece of paper can be torn off and then affixed to most surface areas with the use of its adhesive backing. This includes books, walls, file folders, computers monitors, and even refrigerator doors. 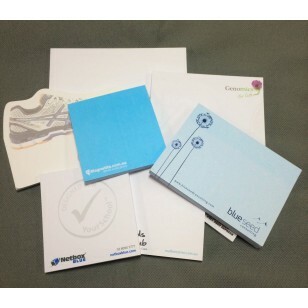 This special backing also allows you to reapply that same sticky note again and again without loosing its adhesive or leaving a residue behind when removed. This can be quite handy when you need to post those messages, notes, or phone numbers in a more prominent location. The displayed price includes a 1colour print on each page of the sticky note cube. Employees should stock up and provide these handy sticky note cubes to all their employees. They make wonderful organizational tools for the office. By using the cubes, employees can store important notes in one visible location, right at their finger tips for quick reference. This allows employees to streamline all their paperwork in for a clean, professional manner. The cubes are so compact and attractive that chances are they will sit on the desktop, rather than tossed away in a desk drawer. The functionality and organizational uses for these sticky note cubes are endless: the adhesive paper sheets can be used as a book mark or for labeling boxes, computer cords and cables. They can even be used to clean the keys on their keyboard by folding the paper with the adhesive side facing out. Your employees will love them. GST is not included and products can only be delivered to customers within Australia.